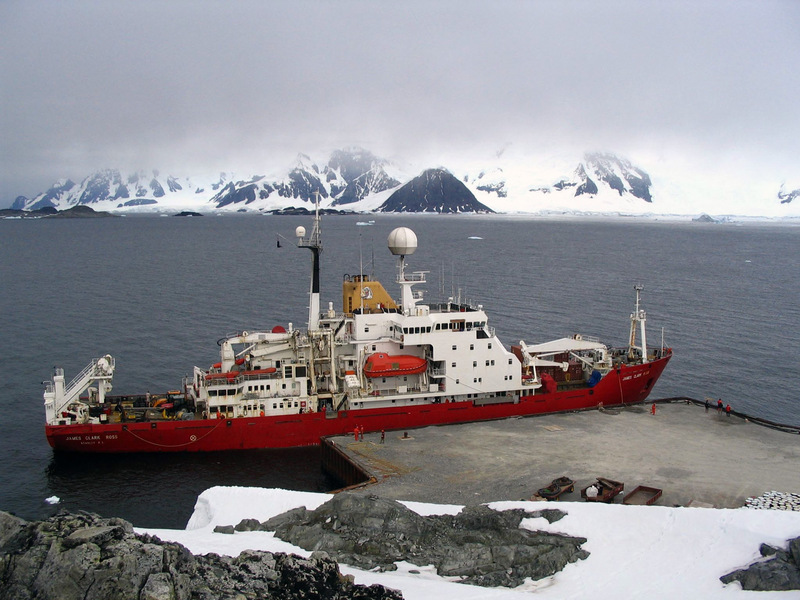 The James Clark Ross is an Antarctic supply and survey ship belonging to the British Antarctic Survey. She is ice strengthened, rather than being an ice breaker and represents a typical compromise solution for the resupply of Antarctic bases and for ship-based scientific work. Ice strengthened ships can't get through thick consolidated sea ice, but that occurs very infrequently in the Antarctic summer itinerary of a supply ship, so for most of the time, simply avoiding the heavy stuff is sufficient. The James Clark Ross was built at Swan Hunters shipyard Newcastle-Upon-Tyne and launched on the 1st of December 1990. She was built specifically for the British Antarctic Survey. Each year she leaves the UK for the Antarctic laden with supplies for British Antarctic and sub-Antarctic bases. 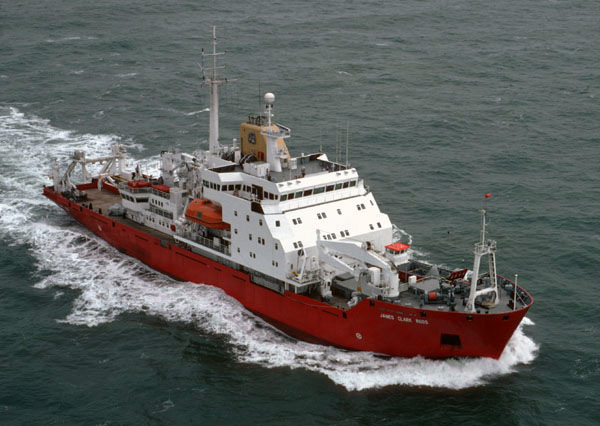 She stays in the southern ocean for the austral summer carrying out oceanographic and biological survey work in between supplying and re-supplying the bases and moving personnel around. Before the start of the Antarctic winter, she heads back to the UK again returning equipment, garbage to be disposed of and last but by no means least, returning Antarctic base members who have been away from the UK from just a few months to nearly two and a half years. Propulsion: Diesel electric. Two diesel engines develop a total of 8,500 shaft horsepower and drive a dynamo to generate electricity to drive an electric motor attached to the propeller. This gives the ability for the propeller to still apply torque (turning force) when pushing against ice or if slowed down. Under these circumstances a direct drive diesel could just stop - and possibly suffer damage in the process. Cruising speed 12 knots (22kmh), ability to break through first year ice 1m thick at 2 knots (3.6kmh) Ice knife positioned behind the rudder to protect the rudder and propeller if required to break ice when going in reverse. Leading edge of the bow has a 150mm thick steel stem bar surrounded by steel 26mm thick. Special high quality low temperature steel is used throughout, this thins to 21.5mm underneath and along the sides of the ship. "Ice belt" extends from 1m above to 1m below the waterline all around the ship. This region has thicker metal and has substantial internal ribs and frames to strengthen it against being squeezed by any surrounding ice. Very "clean" hull with nothing sticking out that might get damaged or knocked off by the ice. This makes for a less stable passage in open waters however. Cooling system has a mechanism to prevent ice being sucked in and causing a blockage. Used warmed water is sprayed back over any ice blocks that may cause problems to help free up the flow when moving through heavy ice. Ability to pump water rapidly from one side of the ship to the other causing a small roll that aids passage when breaking ice. Bow and stern thrusters to help steering in confined spaces, can also be used to loosen ice at the bow and stern. Powerful winches and an open "gate" at the stern for operating trawl nets or towing various surveying devices behind the ship. Series of laboratories on board for analysis of water, biological specimens or other oceanographic data collected.